As Vice-President, Communications, Scott Henderson leads the strategic, day-to-day operations of program and talent publicity, internal and corporate communications, public affairs, community investment, and events and ticketing for all of Bell Media. 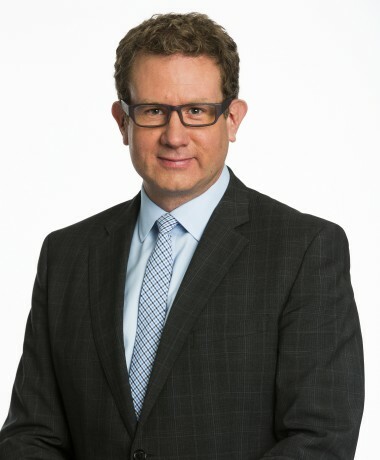 Henderson is responsible for all communications efforts for the company’s two conventional networks, CTV and CTV Two; Bell Media’s stable of entertainment, factual, sports, news, specialty and pay channels; as well as the company’s radio stations, digital properties, and out-of-home division. An industry trailblazer and advocate for strategic and fulsome communication strategies surrounding original Canadian content, Henderson was promoted to from director to Vice-President, Communications in 2007. He has overseen the publicity campaigns for some of the Canada’s most-watched and successful original programs, including CORNER GAS, ORPHAN BLACK, LETTERKENNY, 19-2, SAVING HOPE, CANADIAN IDOL, DEGRASSI, FLASHPOINT, MASTERCHEF CANADA, and THE AMAZING RACE CANADA, THE JUNO AWARDS, and MUCH MUSIC VIDEO AWARDS. Henderson oversaw communications for Canada’s Olympic Broadcast Media Consortium, and helped share the story of the Vancouver 2010 Olympic Winter Games – the most-watched programming in Canadian television history – as well as London 2012. He was also integral to the successful acquisition and integration of Astral, and more recently, partnerships with iHeartMedia and Michael Cohl’s Iconic Entertainment Studios. A 20 year veteran of the company, Henderson began his career at The Comedy Network shortly after its launch. Henderson is a director on the boards of the Banff World Media Festival, Hot Docs, the Toronto Entertainment District BIA and the Academy of Canadian Cinema, where he helped redesign its week-long celebration of Canadian television and film, including the Academy’s public-facing Family Fan Day event. Additionally, Henderson chairs the Communications Committee for the Television Bureau of Canada and sits on the Marketing Committee for THE JUNO AWARDS. He has been a panelist on the promotion of original content, including at Prime Time in Ottawa. Henderson is an honours graduate of Queen’s University, as well as the Humber College Public Relations Certificate Program.